You would think people would see your yellow bike a lot better than they did the blue/black F4i. Stay safe out there man. Danger is from that car about to turn right....into your lane and possibly you. My choice of lane position will be to the inside of your lane...it might invite the guy to turn right but will give you more of a space cushion to do something about it. Could also flash your brights. Remember, don't watch the driver for clues...watch the front tire. You see it turn or start to creep you know something is about to happen. I'm going to go with the guy behind the white Nissan moves into your lane during the turn to pass the Nissan as he doesn't see you since you may have been in his blind spot? Nissan moves into your lane during turn w/out looking? The gravel/debris in front of you looks a lot worse than it is and made you slip a tad? Car turning right, into your lane, coming from opposite side. Looks like a Camry? I'm gonna say the same as vfrman. That car turning right, near the end of your curve. I would say that the danger comes from both left, right and behind, you never know what idiot will cut into you lane. What I think happened - maybe that the white car suddenly changes lane and "didn't see you coming". Nissan will come into your lane after turning the corner? Sorry guys, lost the video. But vfrman is correct: the car tried to turn right into the space me and my bike was occupying. Actually jveach, that's part of my daily commute. This exact situation happens at least twice a week (seriously). 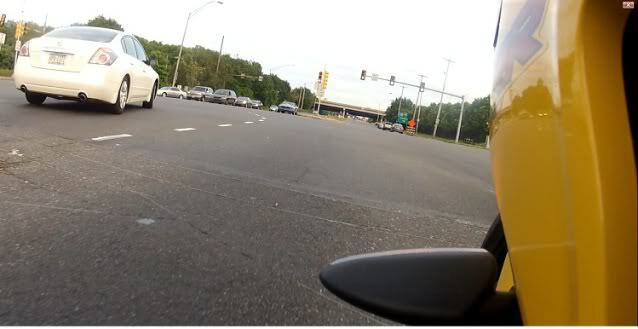 I'm more than familiar with the corner so whenever I take that left, I do it gently enough I can swerve / stop... or like I did that day: hit the horn and shock him out of his stupidity. It was stupidity because he actually waited until we all began the turn before he started to go. Quick Reply: where's the danger?